This 2002 house started out as an Airstream trailer and grew from there. Our design lets you take the core of your house—the kitchen, laundry room, and bathroom—to the beach with you for the weekend or permanently move the house to another state. The University of Texas at Austin team came up with a unique design solution to complement America's increasingly mobile lifestyle. 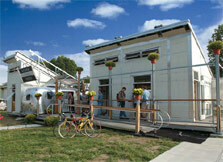 Prefabricated, prewired modules and an open building system allow for efficient, rapid assembly. Consumers need only purchase one home and take it with them when they relocate, or add or subtract sections over time. An Airstream RV trailer docked in a bay in the middle of the house allows the consumer to take the core of the house away for the weekend. The Airstream houses all the "wet" rooms of the home—the kitchen and bath. The team dubbed this the "Mobile Utility Unit" or MUU. The land-locked sections included the living room, office, and bedroom. The modular design of these pieces means they can be added or removed easily. Between the trailer and land-anchored sections of the house runs a breezy deck area for enjoying the great outdoors. In addition to the creative MUU, this house is packed with solar and energy efficiency features. The team employed state-of-the-art engineering tools, such as Solar Path computer modeling, to help design an optimal photovoltaic system. Because different manufacturers sell many different sizes of photovoltaic panels, the team decided to use a combination of two different systems to maximize the number of panels they could fit on the roof. Even though they have two separate systems (one is solely dedicated to charging the car), the UT team sent all the electricity produced through a single inverter. This helps maximize the efficiency of their PV system, because there is always some energy loss at the inverter. The UT team developed a DVD that they played on the TV during tours of their house, in the media tent, in the Solar Decathlon information tent, and on their Web site. Although the engineering and architecture students came to the table with a few differing opinions, one thing the team agreed on was its approach to the Getting Around contest. In keeping with the spirit of energy conservation and efficiency, the team met the contest requirements but did not try to add extra points to their score by logging extra miles in the car. The team placed 11th in the Getting Around contest, but they showed the importance of sticking to their principles. Besides, they always had the MUU to get around in!